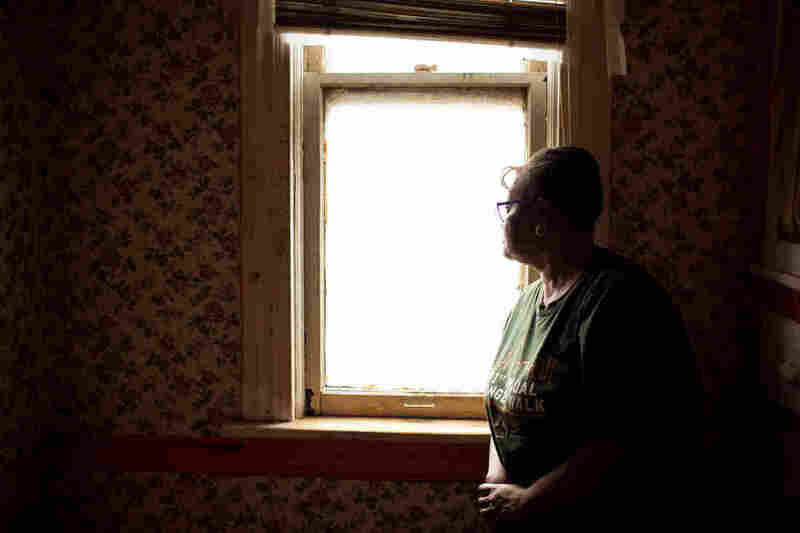 In Great Lakes Cities, The Poorest Residents Can't Afford High Water Costs The Great Lakes are one of the world's largest sources of fresh water, but many Americans in surrounding cities face a dark irony: They can't afford their rising water bills. This story is part of a collaboration with APM Reports, the investigative unit of American Public Media, and Great Lakes Today. 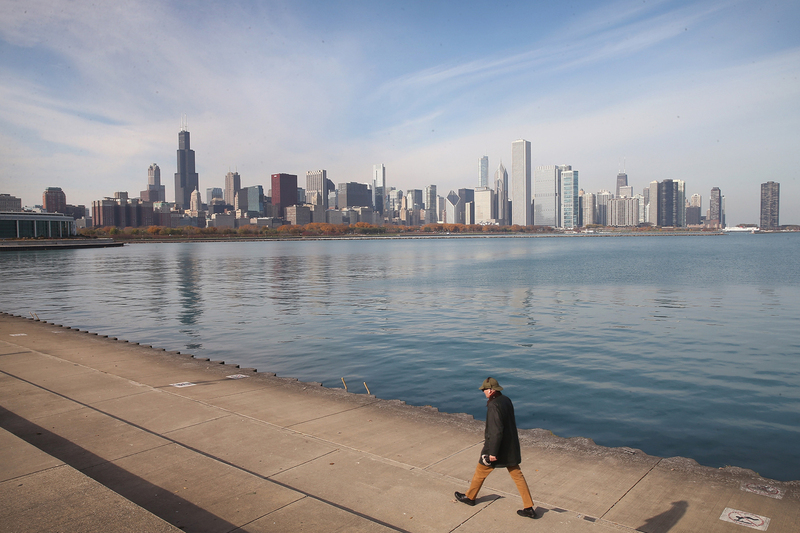 The crisis of water affordability is especially acute where you might not expect it: In cities like Chicago, which overlooks the abundant fresh water of Lake Michigan. For months, Rev. Falicia Campbell kept a secret from her congregation, her friends and even her adult children. It was a secret she was ashamed to divulge: She was living without running water. Like a growing number of Americans, the 63-year-old Chicago resident couldn't afford to pay her rising water bills. She inherited her mother's house in Englewood, a poor neighborhood on the city's South Side, and last year received a $5,000 bill. Campbell is partially blind and lives on a fixed income from disability payments. She dedicates most of her time to helping her community. Her church includes a resource center that provides food and shelter for poor and homeless people. She couldn't pay off her water debt, and in August her water was turned off. The Chicago water department offered her a payment plan but required a more than $1,700 deposit before restoring her water. She didn't have it. Here she was living a few miles from Lake Michigan, one of the largest sources of fresh water in the world, and she didn't have running water in her house. Without it, her daily life became a struggle. "I just said, 'Oh God, whatever I did, forgive me,'" Campbell said. "This was a lesson. I had my lights off before, my gas off. But water, I didn't realize how important water was until I didn't have it." Rev. 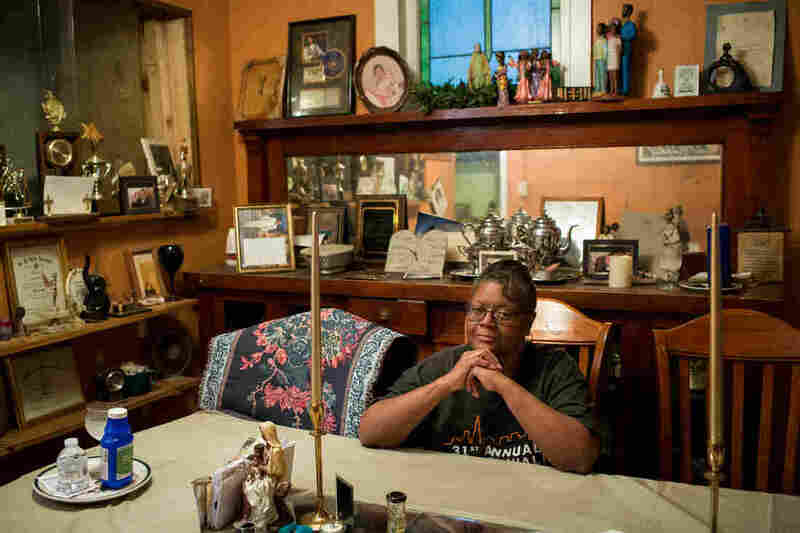 Falicia Campbell, 63, was living in Chicago without running water, a secret she kept from friends and family. Campbell is a victim of a growing American water crisis. In cities across the country, the cost of water has spiked in recent years, forcing hundreds of thousands of people to perilously endure weeks or even months without an essential resource. The crisis is especially acute where you would least expect it – the Great Lakes, the region of the country with the most abundant fresh water. A nine-month investigation by APM Reports examined the cost of water in six large cities near the Great Lakes – Chicago, Cleveland, Milwaukee, Detroit, Buffalo and Duluth – over the past 10 years and found that rates have risen alarmingly fast. In Chicago, the cost of water for the average family of four nearly tripled between 2007 and 2018. Cleveland's rates more than doubled – to $1,317 per year for an average family of four. And families in Detroit paid an astounding $1,151 annually. By contrast, that same average family living in Phoenix, which pipes in much of its water from 300 miles away and has been called the least-sustainable city in the country, paid about two-thirds less. Don't see the graphic above? Click here. Many cities have been forced to raise rates to deal with decrepit infrastructure – leaking, cracking water pipes that in some places date to the 19th century. With the federal government allocating less money for water infrastructure, most cities have foisted the bill on to their customers, especially those who can least afford it. The APM Reports investigation found that the rising cost of water has hit poor families the hardest; the government-run water utilities in these six cities have issued at least 367,740 shut-off notices in the past decade. And an analysis of shut-off data revealed disproportionately high concentrations of water shut-offs in poorer areas and in majority black and Latino neighborhoods in every city. Unlike more visible infrastructure problems – such as electrical blackouts, dangerous bridges or clogged highways – wealthier Americans may not even know that water prices have spiked. But for millions struggling to afford water, or living without it, the crisis can be life-altering. For months, Campbell's basic tasks like doing the dishes or getting ready to leave the house became expensive and arduous. To bathe each morning, she had to pour gallons of bottled water into a pot to heat on a stove. She then carried the water up the steep stairs to the second floor and dumped it into the bath tub. She made the trip multiple times until she had enough water to take a bath. Then she'd use the water for the toilet. By the time she was on her way to her church, she was already exhausted. And there was a financial burden too: She was having to spend $20 a week on bottled water. "There's an old saying you never miss your water until the well runs dry. And I found that out. It's very difficult to get around without water," Campbell said one day last October. By then, her water was back on. With the help of friends and family, it had taken her a month to come up with the deposit demanded by the Chicago water department. She's enrolled in a $120.93 monthly plan. If she's lucky, she'll pay off her debt by September 2021. Falicia Campbell finally got her water turned back on, but she'll be paying off her debt until at least September 2021. Parts of America's crumbling water infrastructure was built more than a century ago. Even the newer pipes – the ones installed in the 1960s and 1970s – are nearing the end of their lifespan. Dealing with these aging pipes, including repairing or replacing them or losing untold gallons to leaks, is costing water utilities an increasing amount of money. In Cleveland, for example, the water department is spending $25 million a year replacing its aging pipes and passing the costs on to consumers. Nationwide, experts estimate that updating the deteriorating system will cost about $1 trillion by 2039. Meanwhile, federal funding hasn't kept up with the need. In the past three decades, the federal government's funding of water infrastructure has dwindled from 63 percent of total spending on water projects in 1977 to only 9 percent in 2014. That means that the federal government decreased the money spent on water pipes from $76 per person in 1977 to $11 per person in 2014, according to a report by the Value of Water Campaign, which is made up of dozens of organizations, including city utilities and advocacy groups. Congress tried to address the lack of infrastructure funding in October, passing the America's Water Infrastructure Act. The bill includes $250 million for states to supply to cities – in the form of low-interest loans – to upgrade or replace aging water pipes. But most experts say that amount is insufficient. Phoenix Water Services Director Kathryn Sorensen said the cost of water is determined not by a city's proximity to water but by the quality of its infrastructure. Phoenix gets its water from the Colorado River, about 200 miles away. It's piped to the city through the Central Arizona Project, built by the U.S. Bureau of Reclamation between 1973 and 1994. The project was for the most part federally funded, but there's a repayment plan in place. "We're not like a natural gas utility or an electrical utility where you can move the product easily over thin wires or in relatively inexpensive pipes," Sorensen said. "You need concrete, steel, iron, and so the cost of a water utility is in its infrastructure, and the trap that a lot of utilities fall into is that they get behind in the rehabilitation and replacement of that infrastructure." Advocates contend that water departments could be doing more to alleviate the pain that high rates inflict on poor residents. In some cases what struggling residents hear from the water department is a coldly, simple message: Pay up or lose water service. 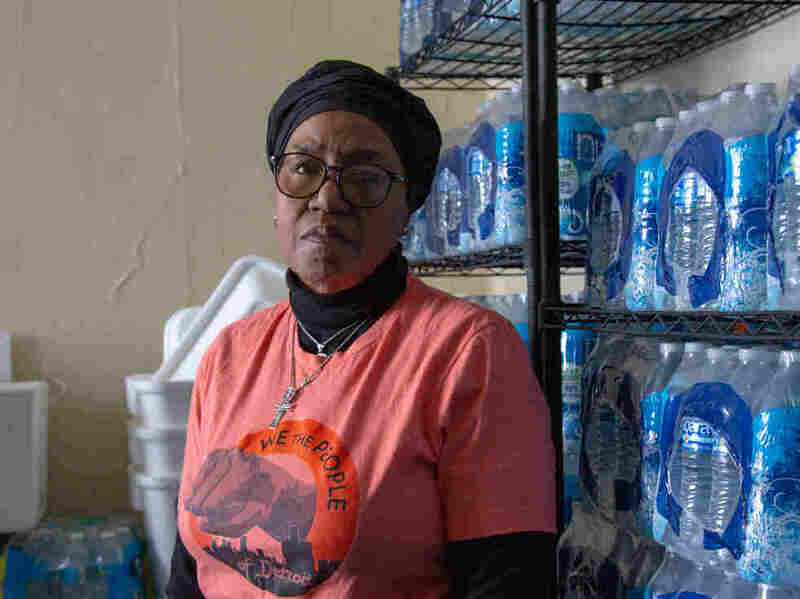 "Water is the number one thing that people, all of us, cannot live without," said Virginia Miller, operations manager of the Midwest Workers Association, which advocates for low-wage workers on Chicago's West Side. "For our city to be shutting off water from families is unacceptable, and it's something that's unacceptable really in the eyes of the world." On a warm August afternoon, Cecily McClellan stood in a room filled with donated bottled water inside St. Peter's Episcopal Church in Detroit. She was getting ready to start her biweekly water deliveries. McClellan is a founding member of We the People of Detroit, a grassroots organization that advocates for affordable water and tries to help those in need, including handing out free water. Before she retired and became an activist, she managed the city's water assistance program. Cecily McClellan stands in a room filled with donated bottled water inside St. Peter's Episcopal Church in Detroit. McClellan is a founding member of We the People of Detroit, which advocates for affordable water. Wearing an Aretha Franklin T-shirt, she climbed into her orange Chevrolet to make her water rounds. She arrived at the house of Reginald Newberry, a now 62-year-old man who had been living without water for two months. He was sitting on his porch when she pulled up. He'd been in the house since he was a baby. He was facing $1,336.93 in delinquent water bills, a total that's grown over the years. As McClellan stacked five cases of water on his porch, Newberry described the absurd scenario he was facing. He suffers from chronic obstructive pulmonary disease, and as McClellan pointed out, he'd recently been in the hospital with pneumonia. Though his water had been shut off for months, he was still getting bills – the city was charging him for sewer – and his balance was growing. On one recent bill was a $22.50 charge for the "water assistance" fund. That's the city program for helping vulnerable people like Newberry who are struggling to afford their water. But Newberry was not getting help from the "assistance" fund; instead he was being charged for it. Back in her car on the way to another delivery, McClellan talked about the city's water crisis. Many of the people McClellan delivers water to have had their service shut-off due to nonpayment. In fact, between 2010 and 2018, the Detroit water department issued 142,953 water shut-off notices, according to records obtained by APM Reports. The cost of water has nearly doubled in Detroit since 2007. The average annual cost of water and sewer fees for a family of four is now about $1,151, according to the APM Reports analysis. "[We the People] let customers know that they do have rights, that water system is owned by the residents of city of Detroit, and that water is a human right and that water should be affordable," McClellan said. 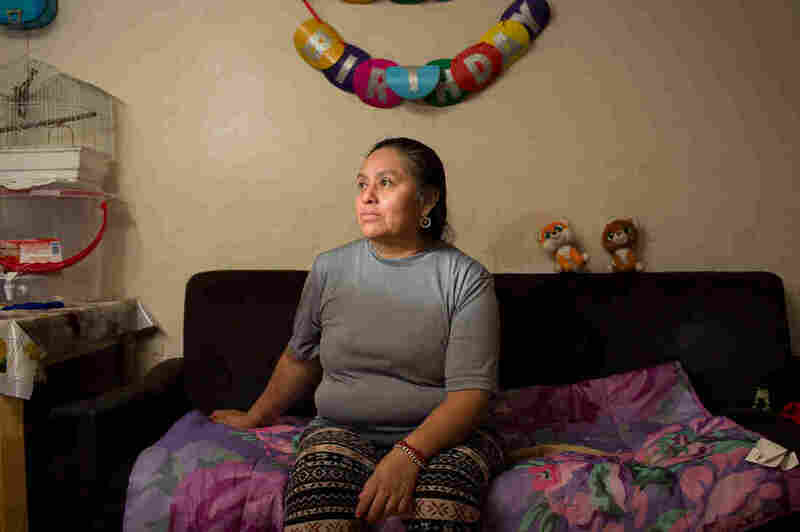 The extent of the water crisis in Chicago is clear on Domitila Valerio's bills. One day last summer, the single mother of two living on Chicago's West Side grabbed several water bills and carefully reviewed them. She said she didn't understand the different charges. The only thing she understood was that her water bill had increased dramatically in one year, and she didn't know why. She pulled out a bill from 2017 that lists a total for water and sewer fees of $88. By 2018, her bill total increased to $716. She said the city water department couldn't explain the increase and only demanded payment. Unable to pay, she was forced into an installment plan to avoid disconnection. Chicago resident Domitila Valerio started noticing her bill increasing in 2018. When the bills escalated to more than $700, she couldn't afford to pay. "It really affected me," Valerio said in Spanish. "I work and earn minimum wage. I had to stop buying things for my children in order to keep the water on." The APM Reports investigation found that the cost of water for customers like Valerio has more than tripled in Chicago since 2007, from $178 per year to $576 for a family of four. In 2018, Valerio started noticing her bill increasing every two months. She was working six days per week for 12 hours a day at a temp agency, and when the bills escalated to more than $700, she couldn't afford to pay. As a single mother with no family in Chicago to lend her money, and without savings or good credit, she had to apply for a $600 loan from a company that offers high-interest, short-term loans for borrowers with bad or no credit. She used that money to pay for her bills, including water. The rate increases have affected the working poor like Valerio disproportionately. Over the past decade, the Chicago water department sent more than 150,000 water shut-off notices. At the same time, the department restored service to just 59,000, according to agency records. Some in Chicago opted for a desperate strategy: stealing water. Residents illegally restored their service 61,642 times in the past decade, according to records obtained by APM Reports. ZIP codes with the highest rates of illegal water restorations were more likely to be concentrated in poor areas, APM Reports found. Tellingly, illegal restoration of water, which carries a $500 penalty, outpaced legal restorations of water in more than half of the years reviewed, APM reports found. Nearly 40 percent of the shut-offs were concentrated in just five of the city's poorest ZIP codes, on Chicago's South and West sides. One ZIP code, which encompasses parts of Roseland, Pullman and West Pullman, had the highest number of shut-offs – more than 17,500 in the past decade. Roseland is one of the poorest neighborhoods in Chicago. The Chicago Water Department declined numerous requests for an interview. Many of the Chicago residents interviewed by APM Reports said the water department was not responsive when they tried to dispute a bill, locate possible water leaks or request a break because they were facing a disconnection despite a chronic illness. People in Cleveland and Detroit expressed similar concerns. Julius Ciaccia, a former head of Cleveland's water department, said that cities used to pride themselves on having cheap water, and that federal investment in infrastructure may have even kept rates artificially low. Now that cities have to pay more for upkeep without much help from Washington, they must bring in more money. "There really isn't another way to pay for these improvements," he said. "I think [water in Cleveland] is affordable for the vast majority of our ratepayers. Even though we have raised rates higher – we're probably on the high end as far as utilities across the country – I think we're at the appropriate level given the challenges we have with the age of our system and the mandates we have to protect the environment and Lake Erie." But Ciaccia stressed that water departments have a responsibility to help people who can't afford water. There has to be a "safety net," he said, such as payment plans and assistance programs to ensure poor families aren't deprived of water. Elizabeth Miller with WCPN in Cleveland and David Montgomery of APM Reports contributed to this report. Support for this project came from the Water Main, an initiative from American Public Media focused on informing and enlightening Americans about critical issues about water.